The International Geneva Car Show is in full swing, and that means that we will have a lot of car and watch announcements this week. So for those who love auto-inspired timepieces, this is going to be a good ride. TAG Heuer announced yesterday it’s new partnership with Aston Martin Racing, and we broke that news here. 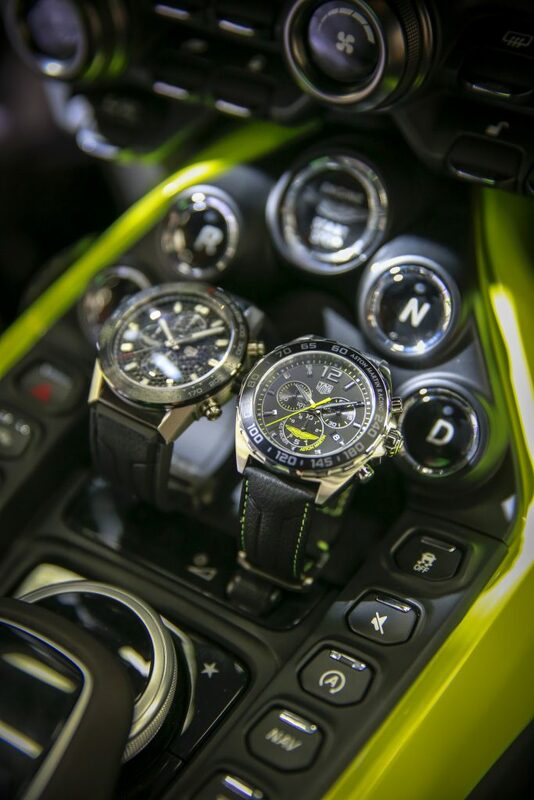 Now we present the first Aston Martin Special Edition chronographs in honor of that partnership: the TAG Heuer Carrera Heuer 01, inspired by the geometric shapes of Aston Martin sports cars, and the TAG Heuer Formula 1 Aston Martin, which is inspired by Aston Martin Racing Team’s lime green color codes. 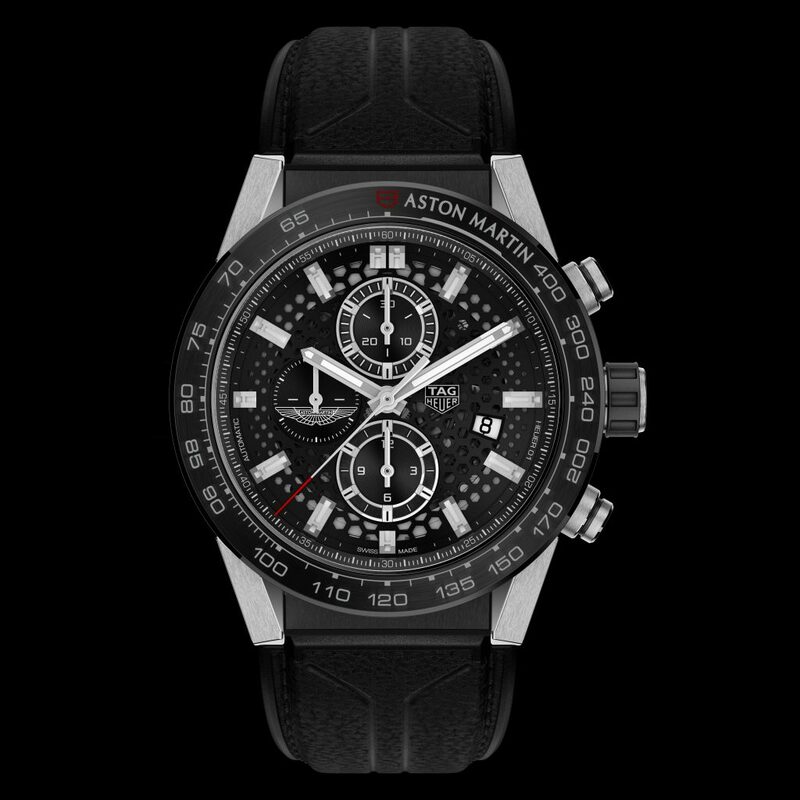 TAG Heuer Carrera Heuer 01 Aston Martin watch is designed to reflect the Aston Martin sports cars, while the TAG Heuer Formula 1 Aston Martin Racing recalls the Aston Martin Racing Team colors. These two special edition Aston Martin watches honor the British luxury car brand and are the result of a collaboration between both Aston Martin and TAG Heuer. 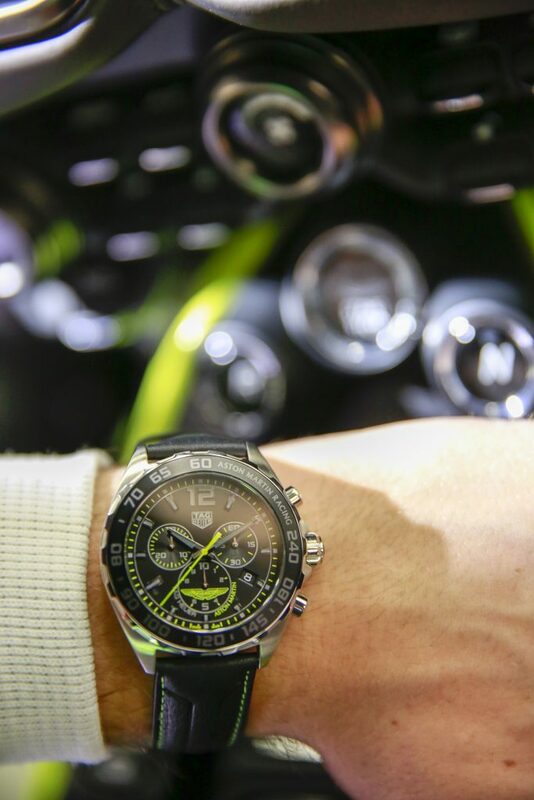 The more upscale of the two watches, the TAG Heuer Carrera Calibre Heuer 01 chronograph is powered by the brand’s in-house-made movement, which is skeltonized in a hexagon pattern to reflect design details on the Aston Martin Vantage car. Visible through the dial of the 45 mm solid steel case, the movement offers hours, minutes, and chronograph functions. The watch has been specially made to feature lugs inspired by the Aston Martin bodywork, a black ceramic tachymeter bezel for measuring speeds, and more. This watch retails for CHF 6,300. 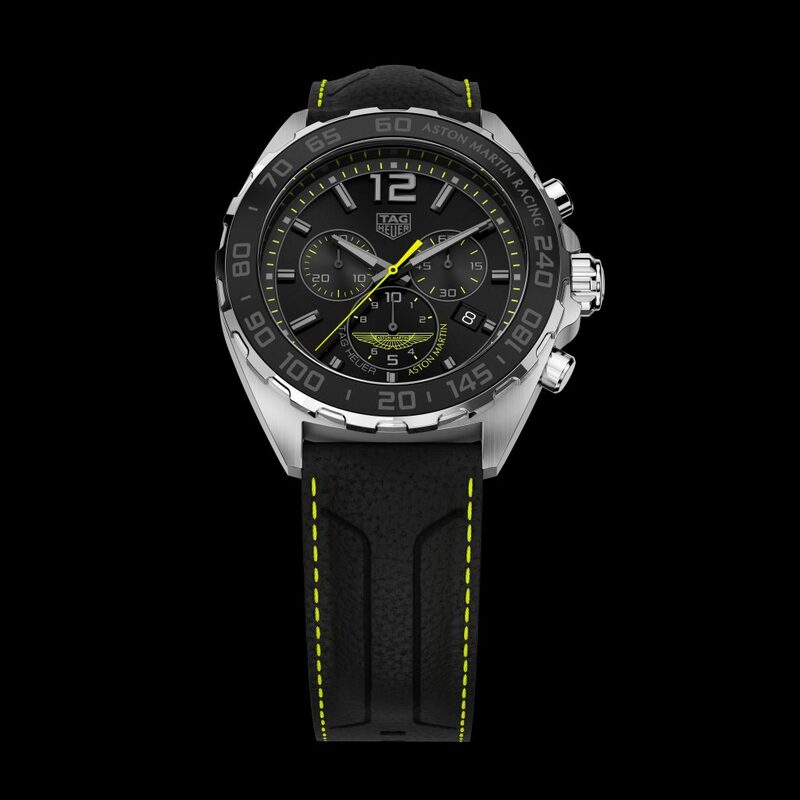 The TAG Heuer Formula 1 Aston Martin Racing chronograph is a 43mm quartz chronograph that measures to a tenth of a second. Crafted in steel with a notched steel bezel . 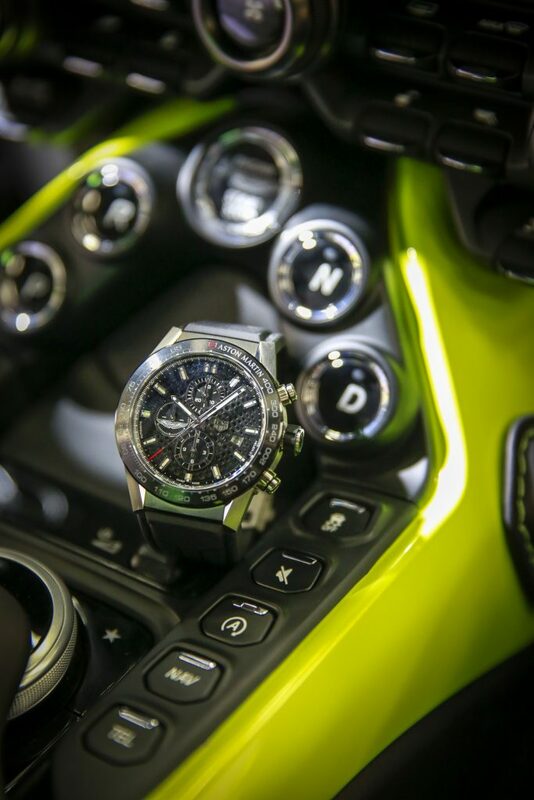 This watch features an aluminium ring with a tachymeter scale, and a black dial with the racing team’s lime green indexes, seconds hand and winged Aston Martin Racing logo. For the first time ever, TAG Heuer equips a Formula 1 watch with a rich leather strap (instead of rubber) with top stitching to reflect the Racing Team. This watch retails for CHF 1,500. TAG Heuer Carrera Heuer 01 Aston Martin watch has design details reflective of sports cars. TAG Heuer Formula 1 Aston Martin makes use of the lime green color of the Aston Martin Racing Team.